Welcome, today I am taking part in 3 Blog Hops. The second one is with Stampin’ Dreams. Whilst attending On Stage Birmingham in November we were told that there are 3 types of stamper. Beginner, Casual and Avid therefore the theme today is a set of cards for each type of stamper. I decided to use the Beauty Abounds Bundle for my set of cards. For this card I stamped Highland Heather ink all over a piece of Whisper White Card Stock. I started by stamping the colour straight onto the card and then stamped a couple of more times too get different levels of colour. Then I stamped the set of flowers, butterfly and sentiments using Black Memento Ink. 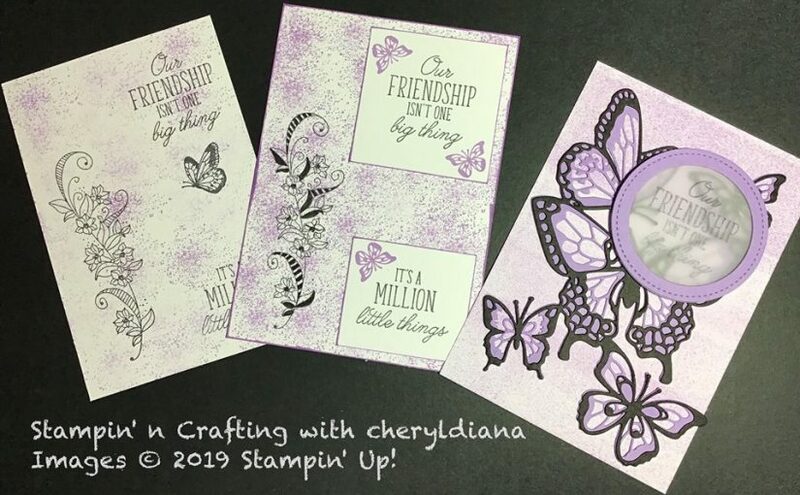 Using the same stamp set I stamped the same back ground but made is darker by only stamping once then again onto the card stock. The set of flowers again was stamped in Black Memento ink but I coloured in certain bits of the card using Basic Black Stampin Marker to make it stand out more. 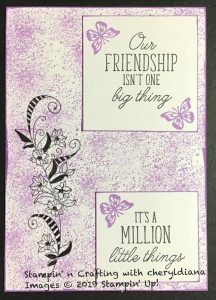 The sentiments were stamped onto cut out squares of Whisper White card stock and the butterflies were stamped using Highland Heather ink. I smudged the edges of the card stock using Highland Heather ink. For this card I brayered Highland ink over the back ground. Then I die cut the lovely butterflies from the Butterfly Beauty Thinlits Dies using Highland Heather and Basic Black card stock. This is the first time I have used them and they are so beautiful. These were then stuck together and fixed to the card base. 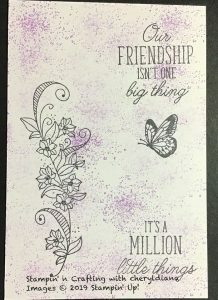 As the butterflies are so beautiful I decided to use only one of the sentiments on the front of the card and use the other one inside. The sentiment was stamped onto vellum and fixed to the Highland Heather frame. I used the Stitched circle dies. 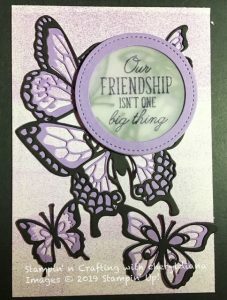 The sentiment was then fixed to the card base using mini stampin dimensionals. I hope you like my set of cards for each type of stamper. Please do leave comments as you hop around and see what cards the others have done. All three cards are great!